Party Lines! Pioneers! Rural Companies! On-line Museum! Links! Comments? Home! Yes, Virginia, it is possible to get keys made to fit your antique payphone! This page is primarily aimed at those working on 3 slot payphones and coin collectors in their collections, but some of the locksmiths mentioned below can also make new keys for single slot payphones legitimately purchased on the used market. Before sending locks for re-keying, you must remove the lock intact. There are several ways to do this, in a 3 slot payphone without a backboard or coin box, you can unscrew the lower section by undoing the bolts which attach the lower portion to the back. Then access to the screws holding the lock can be gained from the back of the phone - remove these, and the lock will come out undamaged. There is another technique which some use - they mask around the key opening on the lock, then use a hammer drill and blunt bit to vibrate the bolts loose. I haven't had great success with this, but I am told it works in many cases. However, to re-key a lock, it is a prerequisite that the old lock be intact. WE, NE, AE payphones use standard master locks for the top section. Northern Electric 21B, Western Electric 10L, 10G, and Automatic Electric 29S lock master keys are available from a lot of vintage telephone dealers such as Phoneco and Oldphoneworks. These will only work on the top locks. You will not be so lucky with coin-box keys, as each phone's lower section is individual keyed. 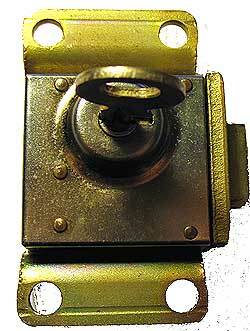 "The locks made and used by Northern & Western are, or at least were, a "protected keyway". That means that no one can make key blanks to fit their locks, except Northern & Western, or any other company designated by N.E. & W.E. to make them. But payphones are on the way out here in North America, and I'm sure the old keyways are no longer made. 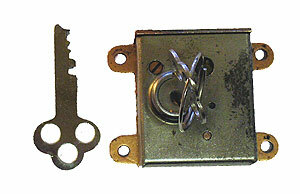 The keyway of a lock consists of the lateral lands and grooves. To see the keyway outline of a lock, and with the tip of the key pointing at you, look down the length of the key. The lands and grooves on the left and right sides of a key are the keyway outline. Ordinary locks and keys, such as Weiser, Schlage, QuickSet, Corbin, Yale and so on, have keyways that were once protected by patent. But once a patent runs out in about 10 years, anybody can make the keyway. But protected keyways are a different matter." Try first local locksmiths. Chances are that they will not have the correct blanks, but it is worth a try. There are several people who can duplicate most payphone keys. I will list any I hear of below. One gentleman whose services I have used recently and that I am very pleased with is Jody Haralson. After seeing his advertisement in an issue of the TCI newsletter, I decided to contact him. His ad read, "I repair all payphone locks. All Ace tubular cam locks and keys repaired and cut. Hard to find key blanks. Northern, Western, and Automatic Payphone lock and keys." I recently added a 1909 Gray coin collector to my collection which came without keys to its lock, the key-less lock sitting in its coin drawer. I sent the lock to Jody express mail, and a few days later got a phone call from him. The keys were made, the lock now worked, and he was wondering what the best way would be to return it. Sure is nice to have the lock back and put back on my beloved Gray #14!. Photo below of the Gray lock and keys. The charge for these keys was $10 apiece. Other locks may cost more, depending on the complexity of the lock. The best way to find out what it will cost is to telephone Jody - he will tell you. I am sorry, but Jody is no longer available. If any others know of anyone providing this service, please let me know, so they can be added to this listing! "The Telephone on P.E.I. "/"The Telephone Museum of P.E.I." Return to "The Island Register"!